Being a retiree means that you have all the time in the world to chase your hobbies and passions. Of course, it also means that you have an incredible number of choices ahead of you. What are some of the best things you can start doing with your time? Did you know that some colleges will let retirees sit into lectures for free? If there's something you've always been interested in learning more about, consider going back to school. Community colleges often have affordable non-credit courses in a variety of subjects, ranging from the arts to the sciences. You can call to request a brochure -- or look into classes being held at a local community center. Community gardens let you plant fruits, vegetables, and even flowers within an active and social space. Gardening is fantastic for both your physical and mental health, and gives you the opportunity to meet other retirees. 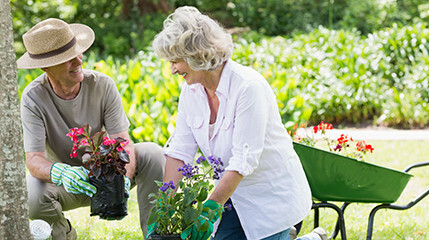 Many communities already have a garden in place; if you're moving and scoping out new and 55+ communities, you can look for one that has one nearby. Many cities also have their own community garden, where you can meet your neighbors and find out more about what's going on in your neighborhood. It's also a fantastic family activity if you want something to do with other family members. Many coffee shops today have a wide variety of games, from Chess to Connect 4. You don't need to be an expert "gamer" to start playing games at your local shop; just ask them whether they host any events. This is a good way to meet people new to the area. In many 55+ communities you can join a card club, and there are services like "MeetUp.com" that have groups meant for retirees. Dance classes are available for all types of dance, such as traditional ballroom dancing or salsa. If you and your partner want something exciting and fun to do together, you can take up dancing to remain active and romantic. If there's always been a language you've wanted to learn, now may be the time to take a class. It's often difficult to learn a new language until you can fully immerse yourself in it and speak it with others; now you have the opportunity to spend the time on it. You may even be able to take a group trip someday to a location that speaks the language! Many want to read but just don't have the time for it. Consider joining a book club that relates to your interests, such as a true crime book club, or a science-fiction book club. You can discuss books with friends and find new books you might not otherwise read. Want to get yourself moving? Think about joining a yoga club, aerobics club, or cycling. You can start walking or hiking today, keeping both your body and your mind active. If you're looking for a community to move to -- and this idea appeals to you -- try finding a place that has some nice walking trails around it. If there's ever been anything you've been dying to do, now is the time to do it! Take advantage of all that free time and start making some new friends. And if you're looking to make a move, call us now to find out about our exclusive communities.